Jiminy Cricket is the royal chronicler in charge of recording Sora, Donald, and Goofy's journeys in his journals. He also happens to be Pinocchio's conscience who "keeps him to the straight and narrow". Jiminy was delegated the royal chronicler by Queen Minnie as Donald and Goofy prepared for their quest to find the King and the mysterious "key". He was separated from his friends when his world disappeared. He was the only one who made it to Disney Castle. When the three of them met Sora at Traverse Town, Jiminy sensed that they would be embarking on many huge adventures and told himself that it was all up to him to record it. When one of these adventures took them back to Traverse Town, he was surprised to find Pinocchio in Cid's accessory shop. He tells the wooden boy how terribly worried he was and even chastises him for lying. He reminds Pinocchio of his promise to Geppetto to be good, so that he could become a real boy. However, Jiminy learns that Geppetto was missing and tells Pinocchio to stay put while he "volunteers" Sora, Donald, and Goofy to find the puppet's father. Not long after in their Gummi Ship travels, a monstrous creature appeared before them. Jiminy recognized it as the vicious monster of a whale, Monstro, but they ended up being swallowed by the beast. Inside Monstro, they were surprised by Pinocchio who was quickly walking away from them toward a shipwreck. The group met Geppetto, but their meeting was cut short when Pinocchio ran away again after spotting Riku. Chasing after him, they soon find Pinocchio trapped inside Parasite Cage. After defeating the Heartless and freeing Pinocchio, Riku attempted to take away Pinocchio's heart. Jiminy feared that Pinocchio was badly hurt, but the puppet was fibbing again much to his annoyance. After Riku disappeared and Sora and company were sneezed out of Monstro, they flew back to Traverse Town where they found Pinocchio and Geppetto safe. 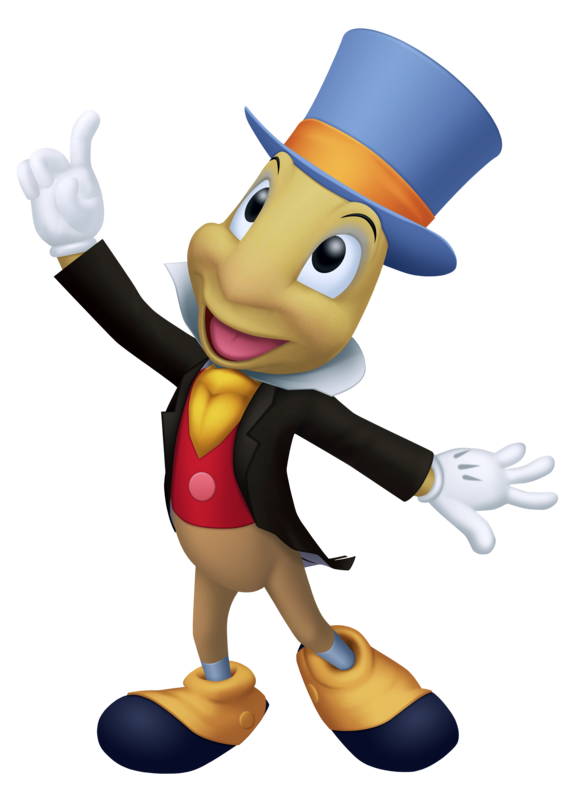 Jiminy Cricket is Pinnochio's conscious who arrived at Disney Castle when his world was overrun by the Heartless. He was given the task of chronicling the adventures of the Keyblade Wielder by Queen Minnie and sent along with Donald and Goofy as they set out to find Sora. Residing mostly in Sora's hood rather than fighting, Jiminy tends to have a general and more objective view of events. He is the one that manages to figure out more about the nature of Castle Oblivion as slowly the party loses its memory the higher up the Castle they go. Eventually they turn to the journal Jiminy kept of their previous adventures, only to find it blank and empty. Jiminy asks Sora to turn back while they still have any of their Memories, but as Sora made a promise to protect Naminé who is being held captive in the Castle, Jiminy is sympathetic and agrees to go along. He lives to regret that decision when Sora abandons Donald and Goofy and he alone remains with him to hear Naminé tell Sora the truth before Donald and Goofy arrive at the scene - that their Memories were altered by Naminé at the Organization's orders. Having been with Sora through the whole ordeal, Jiminy is the one who is able to speak to Naminé when Sora is too emotionally distraught. He is also the one to sympathize more with Naminé, understanding fully she was being held captive and forced to act against her will. Jiminy also saves the day right before the party goes to sleep in order to restore their Memories. In order for them to know to thank Naminé for restoring their Memories once they wake up, he writes down a special entry about her in his journal, one stating just that - Thank Naminé. It is the only entry left in his journal when they go to sleep. Originally hailing from another world, Jiminy ended up in Disney Castle when his world was overrun by the Heartless. Separated from his beloved friends, Pinnochio and Geppeto, Jiminy was given the role of chronicling Donald and Goofy's adventures by Queen Minnie. Taking great pride in his duty, Jiminy made sure not to miss a single detail of their joint adventure with Sora, the Bearer of the Keyblade, as well as act as a part-time conscious to the group. Along with the trio, Jiminy fell into a yearlong slumber when they had their Memories messed with by Organization XIII. Much to his horror, Jiminy wakes to find his journal a complete blank, save for one mysterious entry, citing a promise they made to thank a girl called Naminé. With no leads as to who this girl is or why they fell asleep, Jiminy is left with little choice but to begin the task a new, and he's very careful as to not leave a single detail undocumented as the group proves themselves to be heroes time and again. Traveling inconspicuously inside the hood of Sora's jacket, Jiminy was the designated recorder of events throughout the party's many travels. He kept detailed records of every event, person, and creature they came across in the different worlds they visited, jotting everything down inside two olive-green notebooks. Strangely enough, he awoke along with Sora, Donald, and Goofy inside the memory pods to find that his first journal was completely blank except for a single line at the back: "Thank Naminé." In turn, while looking through the second journal, he discovered a line that he knew he hadn't written: "Their hurting will be ended when you return to end it." Puzzled as to where both sentences originated from, he and King Mickey decided to convert his journals to data format, so that they might recover some of the lost recordings. This seemingly simple decision quickly grew to be something much greater indeed, as they all would soon find out for themselves. Within the world made from the zeroes and ones of his own journal, Jiminy is able to discover exactly what plagues it through the eyes of Data Sora. Together with Mickey and the others, they travel through worlds that Jiminy had originally visited with the real Sora, but mere technicalities won't stop a growing friendship between the two. As Jiminy exits the Datascape and returns to the real Disney Castle, he knows that although the two will not meet again, the time they spent will not be forgotten, and that's all that matters.